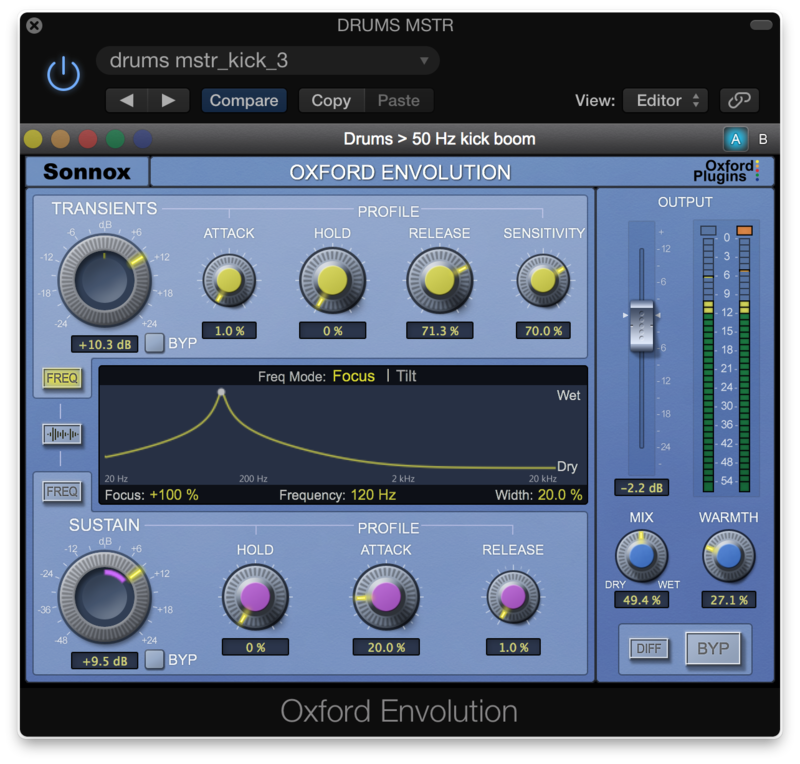 Sonnox has launched a brand new plugin called Envolution. It is a frequency dependent transient shaper. The above pic shows that Envolution offers much more than the usual transient and sustain controls. 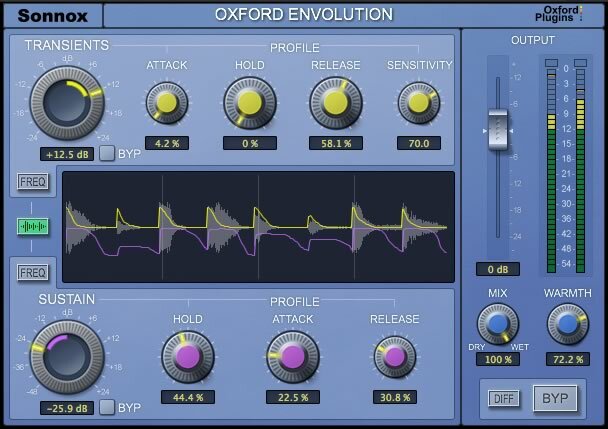 "Envolution is a frequency-dependent envelope shaper with separate transient and sustain sections to radically re-shape the envelope of your instruments or audio. Use a broader tilt mode or the more parametric-style focus mode to choose which frequencies are processed. Insert on a track, bus or even master output to add presence/distance to drums, piano, guitar and any other percussive content. Boost sustain to make the ambience around a recording bloom, or cut it for quick and precise gating. We love the more creative and extreme side of the plug-in too; like using the DIFF button to generate negative ratio compression effects!" I downloaded the Envolution demo and tried it on live drums that needed a little more definition and punch. I was happy with the overall sound of the kit so I placed it on the drum buss master. By using the DIFF switch I found it fairly easy to dial in the settings needed to emphasize the kick. It also slightly enhanced some of the lower frequencies in the toms and snare which made the entire drum kit have more impact. I used the MIX control to blend the "dry" and processed sound and added a little saturation with the WARMTH knob. The output was reduced to match the level when the plugin is bypassed. Warmth control for: - Harmonic saturation/tone shaping & prevention of excessive output levels. 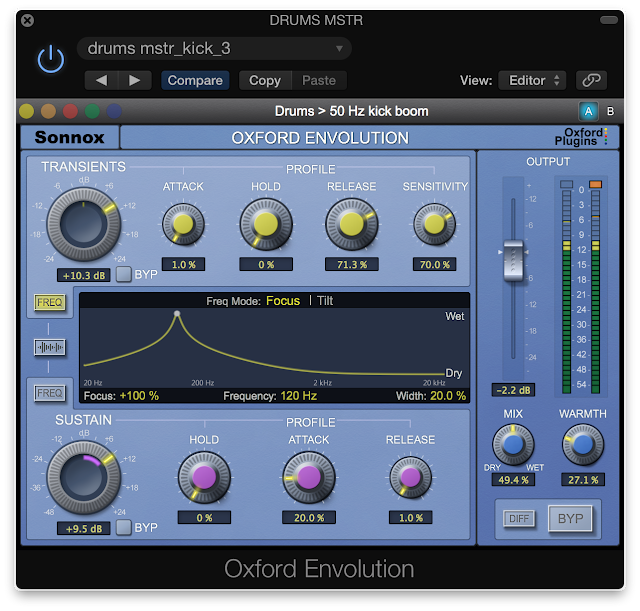 The Sonnox Envolution is available on the website as AAX Native, Audio Units and VST for $270/£170.00. The AAX DSP price is $399/£275.00. Your dealer might have it for a lower price. Download a demo of Envolution here.